NEW YORK – January 16, 2019 –Cadence13, a leading premium podcast media company, today announced the launch of “Meaningful Conversations with Maria Shriver,” the first-ever podcast hosted by Emmy and Peabody Award-winning journalist and bestselling author Maria Shriver. Building on the success of her instant No. 1 New York Times-bestselling book I’ve Been Thinking…Reflections, Prayers and Meditations for a Meaningful Life, and its new companion I’ve Been Thinking…The Journal, Shriver will use her podcast to explore issues and ideas that she believes we’re all thinking about, but not discussing nearly enough. The premiere episode of Season One of “Meaningful Conversations with Maria Shriver” will feature an in-depth interview with Shriver’s longtime friend Rob Lowe and will launch on January 21, 2019 across Apple Podcasts and wherever podcasts are available. The trailer is available to listen to and subscribe now on Apple Podcasts. 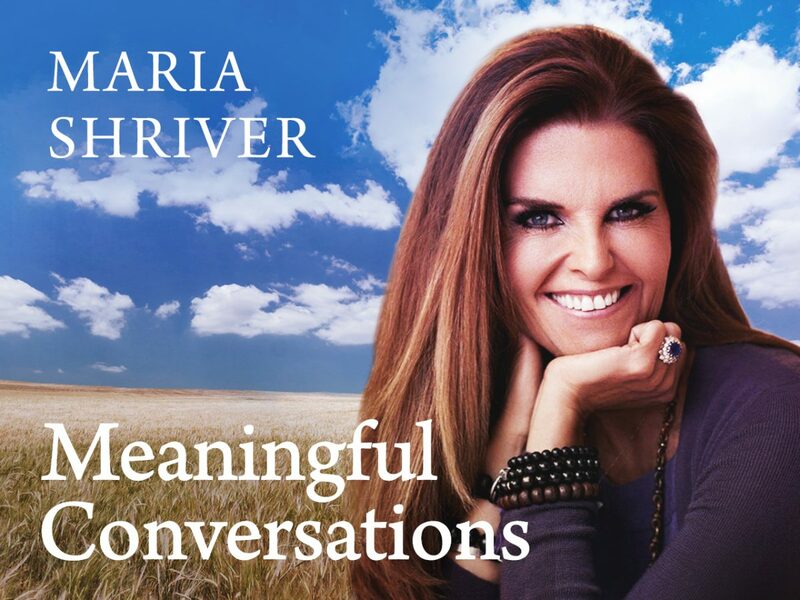 Shriver’s podcast will delve into topics like the powers of faith and forgiveness, how to live life with gratitude and love, the art of self-reinvention, the search for meaningful connections, how to cope with loneliness, and more through intimate, thought-provoking conversations with friends and people she respects and admires. Other special guests this season include renowned spiritual teachers and bestselling authors Marianne Williamson and Don Miguel Ruiz; self-development expert, success coach and bestselling author Jen Sincero; and author, entrepreneur and “biohacker” Dave Asprey. Maria Shriver is the mother of four, a Peabody- and Emmy-award-winning journalist and producer, a seven-time New York Times bestselling author, an NBC News Special Anchor, the founder of the nonprofit The Women’s Alzheimer’s Movement, and the creator of the popular weekly email newsletter “Maria Shriver’s Sunday Paper.” Throughout her life and work, she has used her voice and her platforms to produce socially-conscious television, books, films, and digital media that seek to make a difference and move humanity forward. Cadence13 is a leading premium podcast media company. Our roster of critically-acclaimed shows and personalities reflects the diverse conversations and interests happening in the world, led by a collection of voices that include Sophia Amoruso, Nick Bilton, Rachel Brathen, Kobe Bryant, Gotham Chopra, Remi Cruz, David Dobrik, Jon Favreau, Malcolm Gladwell, Andrew Jenks, Peter King, Tony Kornheiser, Michael Lewis, Payne Lindsey, Jon Lovett, Alisha Marie, CJ McCollum, James Andrew Miller, Jim Norton, Gwyneth Paltrow, Josh Peck, Zac Stuart-Pontier, Paul Rabil, Rhett and Link, Rick Rubin, Michael Sheehan, Maria Shriver, Marc Smerling, Tommy Vietor, Adrian Wojnarowski and many more. These storytellers represent both established and emerging personalities across sports, business, tech, politics, entertainment and news. Cadence13 has a broad range of programming partners including Comments by Celebs, Conde Nast, Crooked Media, Entertainment Weekly, Girlboss Media, goop, Granity Studios, MarketSnacks, Meredith, Mythical Entertainment, Pushkin Industries, Ramble, Seven Bucks Productions, Sports Illustrated, Tenderfoot TV, theSkimm, TNT, UFC, Up and Vanished, UTA, Vanity Fair, Who? Weekly and Yoga Girl, among others. Cadence13 is headquartered in New York, with offices in Los Angeles and San Francisco.